Wimbledon comes to an end this weekend, but, for those involved with ESPN’s tennis coverage, that will mean not a chance to take a breather but rather to keep the momentum going. The network will extend a streak that began on July 2 of tennis coverage appearing on at least one ESPN platform. ESPN’s Jamie Reynolds says Wimbledon Broadcast Services has done a great job in streamlining production processes at Wimbledon. The US Open Series of events, for example, kicks off on July 23 in Atlanta before going to San Jose, CA; Montreal; Cincinnati; Winston-Salem, NC; and New Haven, CT without a single break day. Action in New Haven ends on Aug. 25, and then it is straight over to the Billie Jean King National Tennis Center in New York for the start of qualifiers on Aug. 27. And the qualifying stage of the tennis majors is increasingly important. ESPN, for example, will deliver five courts of qualifying coverage. But, before ESPN shifts its attention back to the U.S., there is still coverage and stories to be told from Wimbledon. The men’s and women’s semifinals are just ahead, and, thankfully, there should be some attractive matchups. This is the first year that ALETC has taken over production of the host coverage from the BBC. The vast majority of the production personnel who have become synonymous with court coverage are still onsite, but there have been a number of technical changes in the facility itself, including some new production-control rooms and quality control. In addition, the facility has embraced IP signal transport, which provides more flexibility in signal availability and lays the groundwork for next-generation formats (Centre Court is also being covered in UDH with HDR). Over the years, Reynolds and the ESPN team at Wimbledon have developed a friendly relationship with the BBC and AELTC. The three have historically worked closely on figuring out shared resources and unilateral resources. The long-range plan, says Reynolds, is to continue to figure out how to amplify Wimbledon for viewers. “It’s not necessarily about focusing on the competition but about the character and legacy of this event and bringing those ingredients together for 14 days. One new element at Wimbledon this year is a Telstra Netcam mounted in the net on Centre Court and providing shots of players charging toward the net. Reynolds says it offers a wow factor for viewers and gives a different perspective from traditional coverage, which typically has players running from left to right or right to left. DirecTV viewers were also treated to an opening week of ITV Wimbledon coverage via a Mosaic channel that offered up to five matches on screen at once. ESPN took advantage of world feeds, unilateral cameras, studio cameras, and content on the EVS network to deliver the experience. 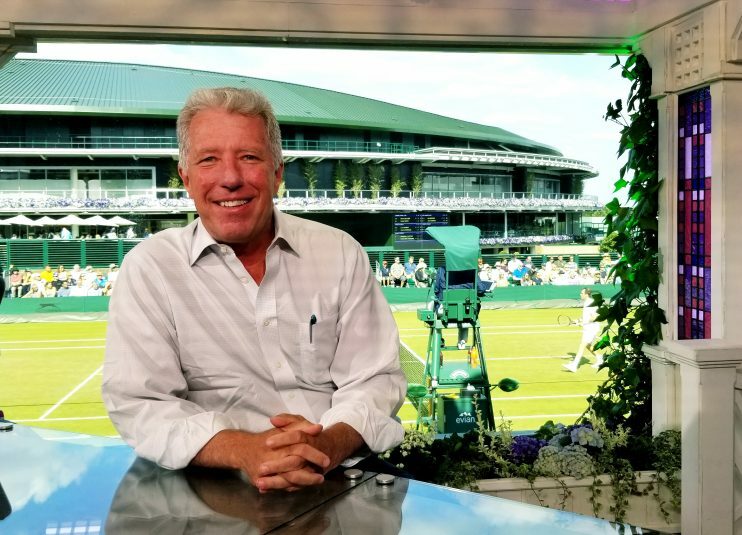 Don Colantonio, executive producer, AT&T content creation, says the transition to working with Wimbledon Broadcast Services has been seamless for the team of six production and 12 technical staffers. This was the second year that Colantonio and the team worked alongside ESPN in Control Room B. On the last day of production, known as “Manic Monday” because of the large number of crucial matches, the Mosaic team shifted to an ad hoc control room in the transmission area that was smaller but configured properly so that the team could meet their objectives. This is also the third year that the Mosaic service has a studio set overlooking Court 14. “From a content perspective, we had more access to players and ESPN analysts,” says Colantonio. The US Open this year will have a special energy from day one, with the USTA Billie Jean Tennis Center sparkling after years of renovations. A new Louis Armstrong Stadium, complete with roof, will open and mark the end of a five-year $600 million transformation of the facility.